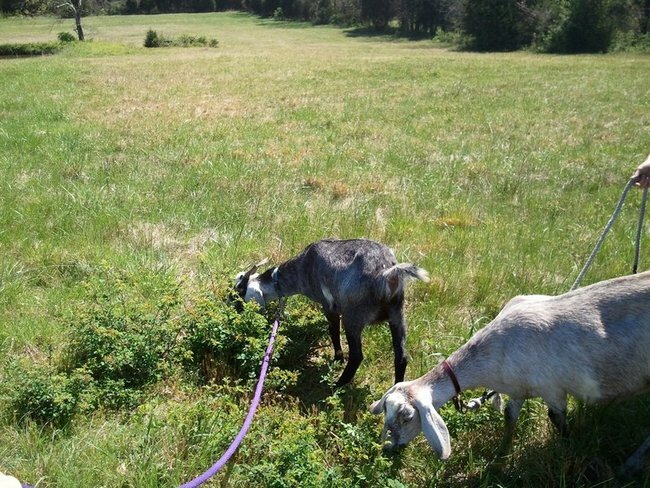 We took the goats on their first pasture walk today. While they have a nice size area to browse and forage during the day, it's really not enough diversity for the goats and we'd like them to get accustomed to browsing in the pastures. The plan is to rotationally graze the herd once we get more goats, the electric fencing and some form of mobile shelter and feed/watering arrangement in place. Meet Bridget, Little Seed's First Goat! What a week! I guess it actually hasn't even been a whole week, but the whirlwind of it all has made the past few days feel like only a split second and a month at the same time. We've been on a mission since last Thursday and I'm just now getting a chance to come up for air and bang out a blog post. And ooooh ho ho, what a mission! In the week before we moved to Tennessee there was a rash of tornadoes that devastated cities throughout the region. We're not in the direct path of "Tornado Alley", but we're pretty close and Tennessee isn't wanting for more tornadoes. Part of the reason we decided to look east of Nashville for land was because west of Nashville typically gets hit worse during tornado season. That doesn't mean we're not at risk, however. Loading the Guineas and Chickens into the salvaged-barn coop. Sophie's curious about her new feathered friends. Big (and busy) weekend for us. Late last week we finished up the salvaged-barn chicken coop, literally screwing down the roof moments before a thunderstorm rolled through. It was good to have a hard rain before the chickens moved in because we got a chance to see where some cracks along the edges of the nesting boxes and a couple cracks along the edges of the coop were letting in rain. We got it all sealed tight by the weekend and on Saturday morning we rolled out to get us some birds. We had our first real thunder storm here on the farm yesterday. At around 5pm thunder started rumbling in the distance and a big low black cloud emerged on the skyline. It moved closer and closer until it was right above us, seemingly touching the tops of the trees.